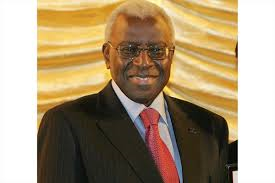 The Norwegian Nobel Committee today has announced that IAAF president Lamine Diack of Senegal has been nominated for the 2014 Nobel Peace Prize for his and his organization’s long and unwavering leadership in the promotion of cooperation through running around the world. Over the past several decades the IAAF has made enormous progress in creating and sustaining running initiatives throughout the world, even as it hopes to culminate those efforts with their proposed Israeli-Palestinian Friendship Marathon Relay, which yearns to bring the long-time enemies into accord through the “Runners Without Borders” program. The event would symbolically use as its finish line the proposed permanent border between Israel and the Palestinian state.